A gas pump. Photo via Wikimedia Commons. The average price of a gallon of self-serve regular gasoline in San Diego County dropped Monday to $3.522, it’s its lowest level since February 2011. The average price has dropped 18 consecutive days and 44 of the past 45, decreasing 30 cents over that span, including 1.5 cents on Sunday, according to figures from the AAA and Oil Price Information Service. The average price is 9.7 cents less than one week ago, 22.5 cents lower than one month ago and 26.5 cents below what it was one year ago. 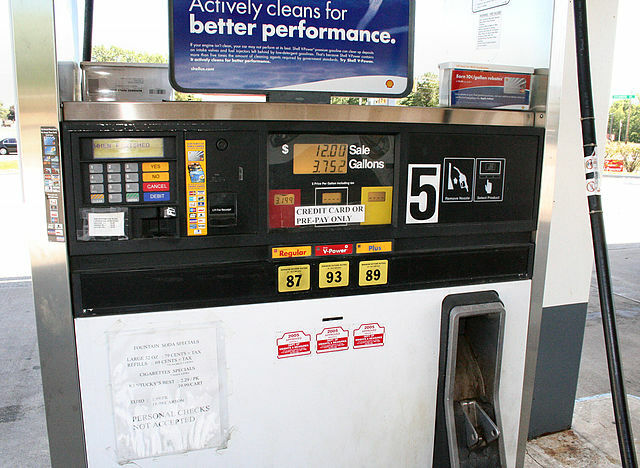 The falling pump prices are the result of plummeting prices for oil and wholesale gasoline, according to Jeffrey Spring of the Automobile Club of Southern California. “Provided no supply issues occur locally, we can expect prices to continue dropping at least in the near future,” Spring said. World oil prices have fallen 25 percent since June due to increased American production of shale oil, steady output from Middle Eastern sources and oil traders’ worries about future economic growth.